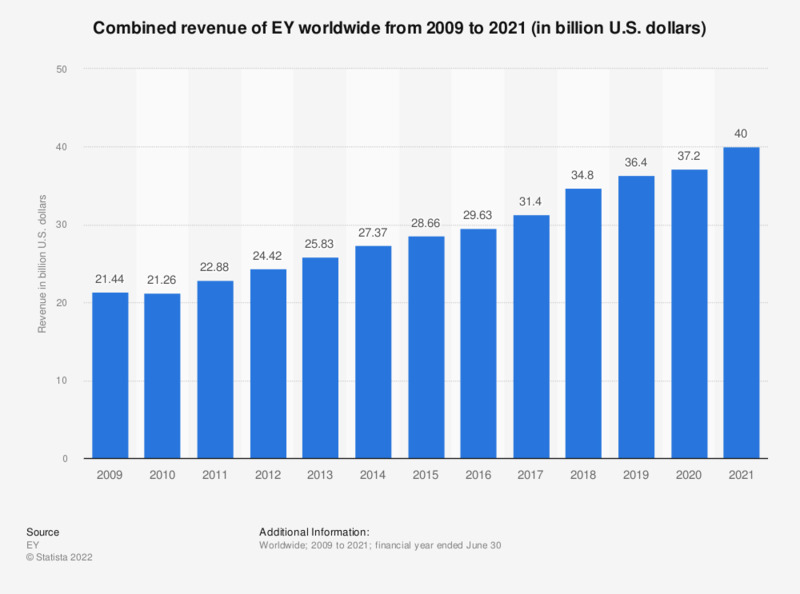 This statistic shows the combined revenue of EY (Ernst & Young) worldwide from 2009 to 2018. In the fiscal year of 2018, EY generated approximately 34.8 billion U.S. dollars, up from 31.4 billion the previous year. Ernst & Young is a global professional services firm and one of the ‘Big Four’ auditing firms, the others being Deloitte, KPMG and PricewaterhouseCoopers (PwC). The company now abbreviates its name to EY since rebranding in 2013. EY provides several business services including, assurance, advisory, tax, and transaction advisory services. The company is spread globally with operations in Europe, the Middle East, Africa, the Americas, Asia-Pacific and Japan. Since 2010, the revenue of Ernst & Young has continuously grown, increasing by over seven billion U.S. dollars in five years. As of 2018, EY was the third third largest accounting firm in the world in terms of revenue, following Deloitte and PwC. In the same year the firm also ranked second in terms of employment with over 261,500 employees worldwide. The next largest was PwC with approximately 250,900 employees worldwide. In 2018, EY generated the majority of its revenue in the Americas, grossing 15.6 billion U.S. dollars. Prior to 2015, Ernst & Young consistently generated its highest revenues in the EMEIA (Europe, Middle East, India and Africa) business region, accumulating over 200 million U.S. dollars more than in the Americas in 2014. How would you characterize the alignment of the PMO to the strategy of your organization?